The Palm Leaf range is unique indeed. With the raw resources being the naturally shed leaf sheath from the Areca Palm in India, this is truly a product that does not impact our environment and utilizes nature in it’s natural state. The Areca Palm tree is a tall, beautiful tree that is hugely abundant in India. The trees are harvested for their fruit, the betel nut. Areca trees have large leaves, or fronds, which shed and fall to the ground every few weeks. The leaves are usually collected and burned. 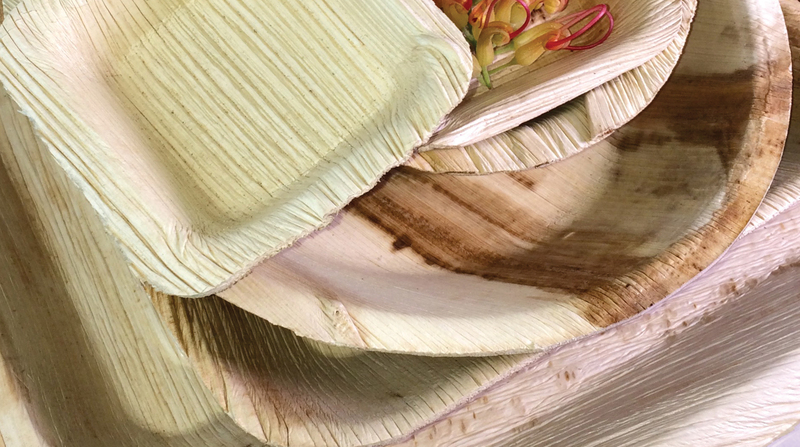 Our Palm Leaf range turns these leaves into disposable plates, bowls, platters and party tableware, as an alternative to paper plates and trays. The products are natural, compostable, biodegradable and stylish. A strong, semi flexible yet not brittle, odourless, water and heat resistant leaf, this product has its own natural grains, characteristic texture and colour. The palm leaf can be used to bake foodstuff and can even tolerate microwave cooking. With such amazing properties, this 100% natural product is beautiful the way nature intended, and can be returned to the earth after use. The leaves are sorted, and then washed and heat pressed into a variety of shapes such as bowls, plates and platters (this also sterilizes the leaf) maximizing the use of this beautiful natural Product. No pulp, no starch, just a washed and pressed leaf. Totally natural. What to do with your Palm Leaf product after use? Use it again or you can compost it. If you don’t compost at home but you’ve got a garden, you could just break the plates up and spread the pieces round your garden. They will break down, enriching the soil like any other leaf, within a couple of months. Beautiful like nature intended, and when finished – return to the Earth.